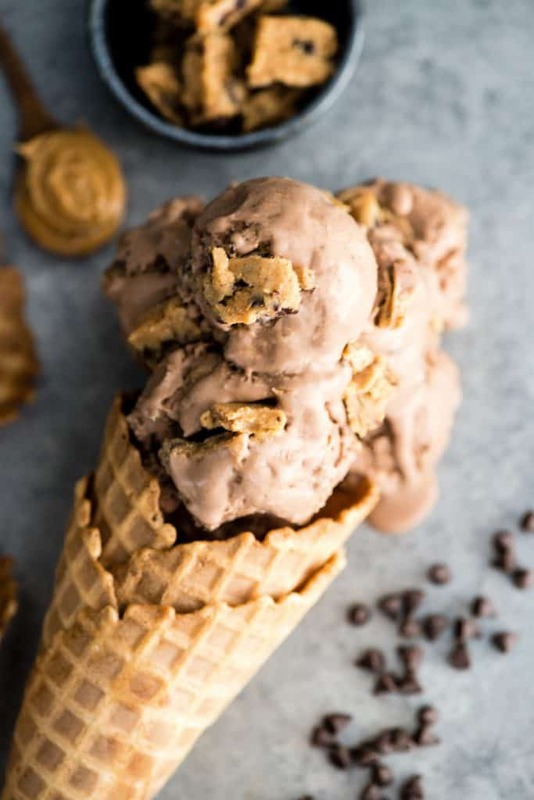 This Dairy-Free Chocolate Peanut Butter Cookie Dough Ice Cream will become your new favorite summer dessert! A creamy, dairy-free chocolate peanut butter ice cream is loaded with healthy peanut butter cookie dough! It’s healthy AND easy to make! Gluten-free and vegan-friendly!! You absolutely have to make it ASAP! This post is sponsored by my friends at Vitamix. As always, all opinions are my own! 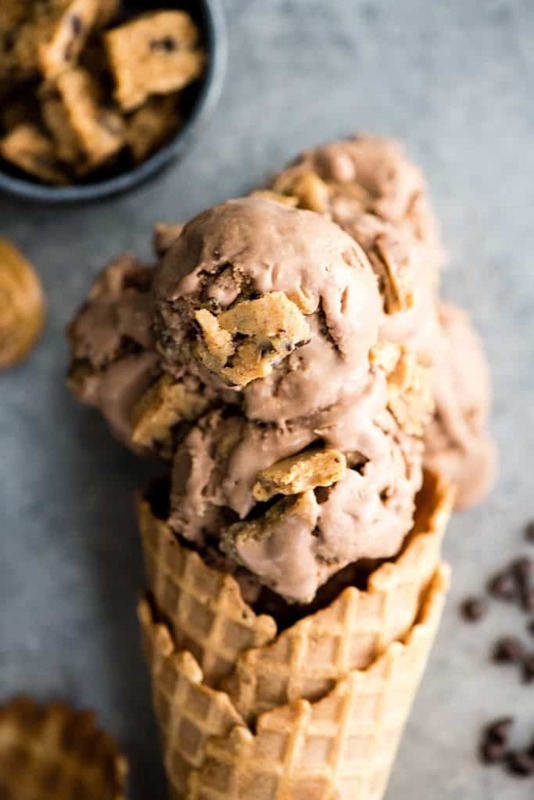 In love with this Chocolate Peanut Butter Cookie Dough Ice Cream recipe. I’m totally serious too. What’s not to love?! 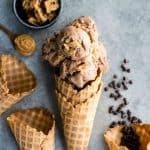 An ice cream recipe that is dairy-free, irresistibly chocolatey, AND loaded with chunks of peanut butter cookie dough is basically what all my dreams are made of! Something I absolutely cannot understand about ice cream shops is that all the ice cream varieties with the best mix-ins always have a vanilla base. And since I believe that dessert isn’t worth eating unless it’s loaded with chocolate…you will never, ever find me ordering said varieties. So once again, to create a truly dreamy ice cream recipe, I resort to making my own. And ladies and gents this Chocolate Peanut Butter Cookie Dough Ice Cream does NOT disappoint. 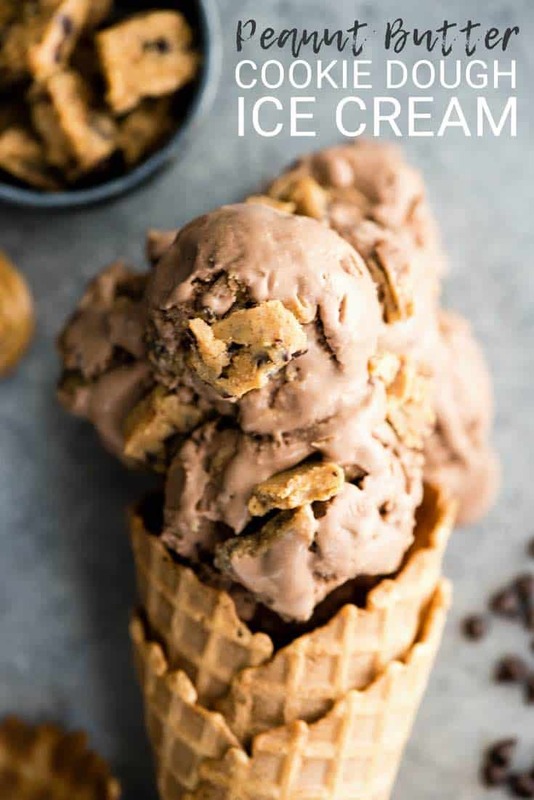 Let’s walk through how to make this peanut butter cookie dough ice cream recipe step-by-step so all of YOUR ice cream dreams can come true! Start by making the oat flour. I never buy ready made oat flour at the store because it’s SO easy to make at home. Toss old-fashioned oats in the Vitamix and blend for 15-30 seconds and presto, you have oat flour. It’s important to do this step first, then remove the oat flour from the Vitamix container and set it aside because when blending, you always want to add the wet ingredients first! Add wet ingredients, then dry. Make sure the coconut oil is melted and the other ingredients are at room temperature to ensure easy blending! Combine the wet ingredients first and then add the try and blend again. Add mini chocolate chips. If you want to keep the mini chocolate chips whole in the peanut butter cookie dough, stir them into the batter by hand. If you would like them broken up into smaller pieces, pulse for literally 1-2 seconds. Any longer could melt the chocolate chips entirely! Spread & Freeze. Next, transfer the peanut butter cookie dough from the Vitamix container onto a baking pan lined with wax or parchment paper. You will want to spread it pretty thin, about 1/4 to 1/2″ thick, and then place it in the freezer while you make the ice cream. The Peanut Butter Cookie Dough is Soft! You will notice that the peanut butter cookie dough is a little bit sticky and soft. That is exactly how we want it to be so it is easy to eat when it is frozen! While the peanut butter cookie dough is freezing, it’s time to make the chocolate peanut butter ice cream base! Use a Vitamix. To make the ice cream base, add all of the ingredients into the container of your Vitamix and blend until smooth! SO easy! Turn on the ice cream maker! 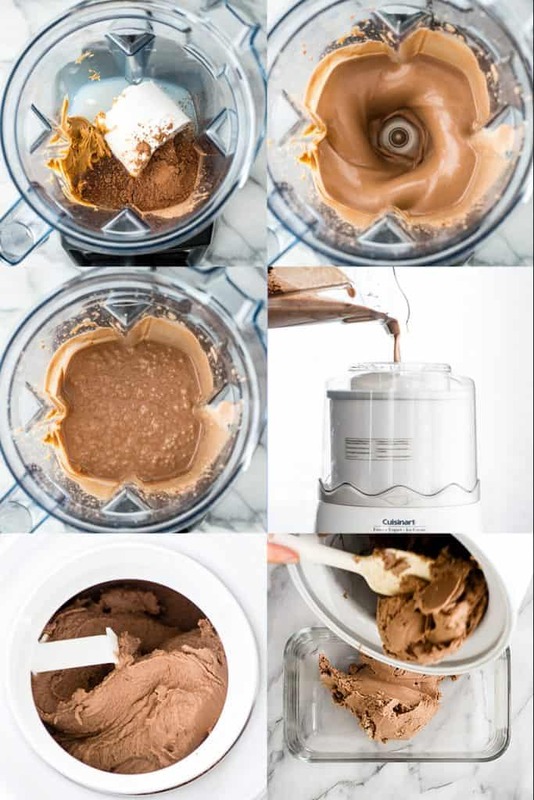 Important tip: When using an ice cream maker it is crucial that you turn the machine on before pouring the mixture into it! Pouring ice cream into an already moving container ensures that it will not freeze to the bottom or sides, which could hinder the churning process by preventing the machine from rotating. Churn! Next pour the mixture into an ice cream maker and let it churn! It’s very important that (unlike many other recipes) you do not chill the chocolate peanut butter ice cream mixture made in the Vitamix before pouring it into the ice cream maker! It must go directly from the Vitamix into the ice cream maker. The container of the ice cream maker DOES need to be frozen, however! How to know it’s finished. When your Dairy-Free Chocolate Peanut Butter Ice Cream forms a ball and no longer has a liquid consistency, it is done! At this point it could become so thick that the ice cream maker stops rotating, which is another indicator that it’s ready! 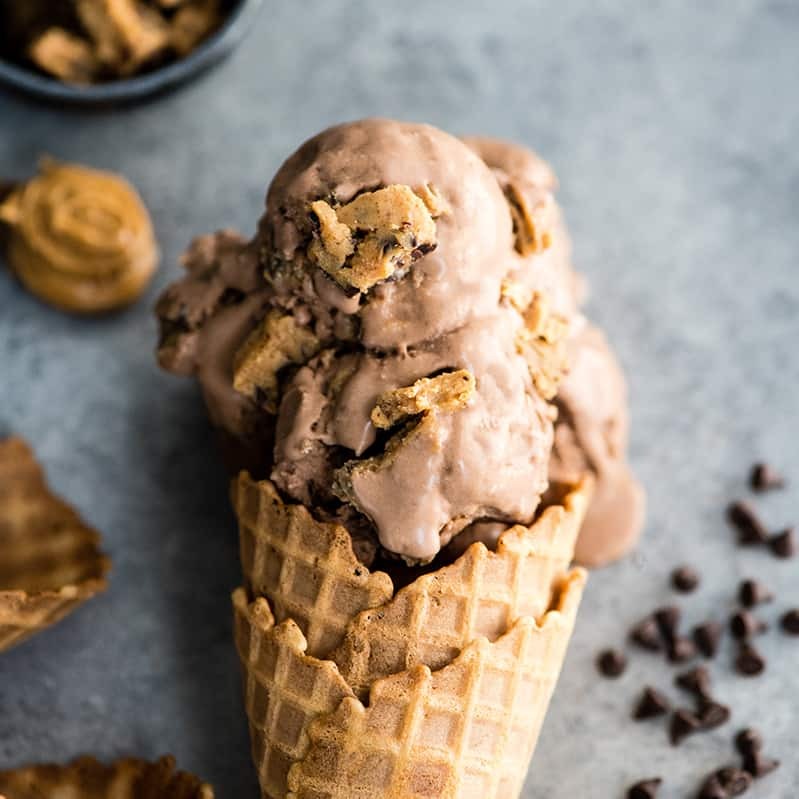 Once the ice cream has finished churning and the peanut butter cookie dough is hardened, it’s time to put everything together to make this Chocolate Peanut Butter Cookie Dough Ice Cream! Transfer the chocolate peanut butter ice cream to a freezer-friendly container. I use a glass container similar to this one to store my ice cream and I love it! Cut and add the Peanut Butter Cookie Dough. Remove the cookie dough from the freezer and chop it into small pieces with a sharp knife. Add it to the ice cream in the freezer-friendly container and stir until it’s evenly distributed. Freeze. Let the peanut butter cookie dough ice cream freeze for at least 1 hour before eating! Enjoy! I recommend removing the peanut butter cookie dough ice cream from the freezer about 5 minutes before you would like to eat it so that it is easier to scoop! Let’s chat about the ingredients used in this cookie dough ice cream recipe, as well as possible substitutions! Old-fashioned oats. Here is an important note about substituting ready-made oat flour for the old-fashioned oats in this recipe. Old-fashioned oats yield a 1:1 ratio of oats:oat flour. what I mean is that 1/2 cup oats yields 1/2 cup oat flour! So please, if substituting, be sure to use a full 1/2 cup oat flour! All-purpose or all-purpose gluten-free flour should work in this recipe as well! Peanut butter. If desired, sub any nut or seed butter. However I think peanut butter is by far hte best! Coconut oil. Butter or ghee are great substitutions for coconut oil! Coconut sugar. Any granulated sugar works well in this recipe. Just be sure to choose a variety that complies with your dietary needs. Honey/Maple Syrup. I prefer honey, but maple syrup also tastes amazing and can be used to create a vegan option! Mini chocolate chips. I love the mini chocolate chips in the cookie dough in this recipe, however they can easily be omitted if you prefer to leave them out, without sacrificing taste! Coconut Cream. I adore making dairy-free ice cream with coconut cream (the whole can, liquid and solid portions). I think it yields the creamiest result possible. However, full-fat coconut milk can also be used with delicious results! 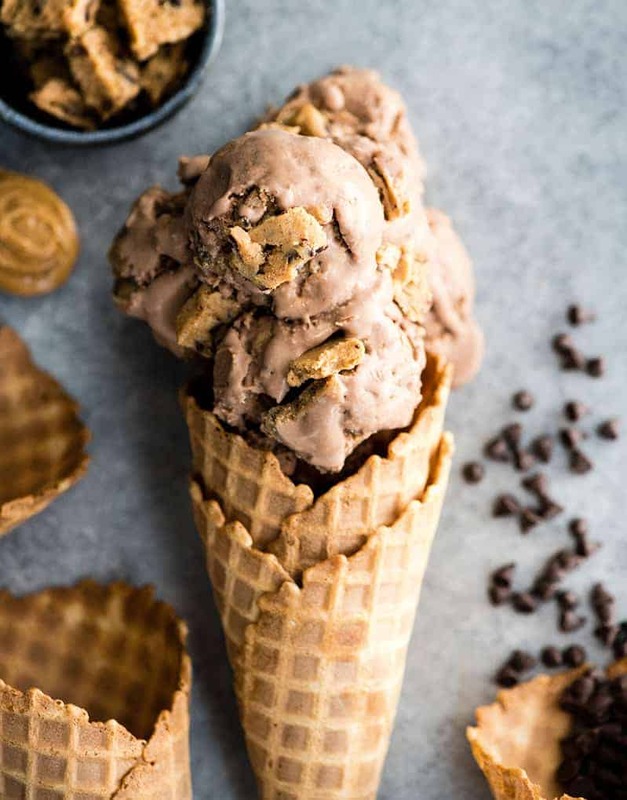 This Dairy-Free Chocolate Peanut Butter Cookie Dough Ice Cream will become your new favorite summer dessert! A creamy, dairy-free chocolate peanut butter ice cream is loaded with healthy peanut butter cookie dough! It's healthy AND easy to make! Gluten-free and vegan-friendly!! You absolutely have to make it ASAP! Put old-fashioned oats in the container of your Vitamix. Place the lid on and blend, starting on low speed and increasing to high, for 30 seconds, or until the oats reach the consistency of flour. Transfer the oat flour from the container into a small bowl and set aside. (Alternately, skip these two steps and use an equal amount of oat flour (added after blending the wet ingredients together). Return the container to the Vitamix base and put peanut butter, melted coconut oil, coconut sugar, and honey (or maple syrup for a vegan option) into the container. Blend, starting on low speed and increasing to high, for 30 seconds or until the mixture is smooth. Add vanilla, oat flour, sea salt and baking soda into the container. Add mini chocolate chips and stir them by hand into the peanut butter cookie dough. Line a baking sheet with parchment or wax paper and spread the cookie dough evenly onto the paper. Place the peanut butter cookie dough into the freezer to harden while you make the ice cream. Add all ice cream ingredients into the container of a Vitamix blender. 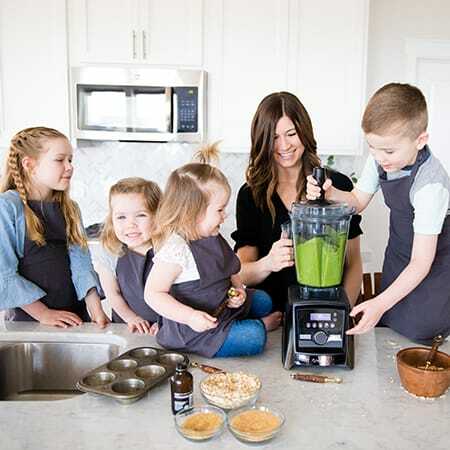 Blend, staring on low speed and increasing to high, for about 30-60 seconds or until all ingredients are combined and the mixture is smooth. Turn on an electric ice cream maker fitted with the frozen base. Pour the mixture from the Vitamix into the ice cream maker (that is turned on). Let the ice cream churn for about 20-25 minutes, or until it has a thick and creamy consistency. Transfer the ice cream mixture from the ice cream maker into a freezer-friendly, glass container. 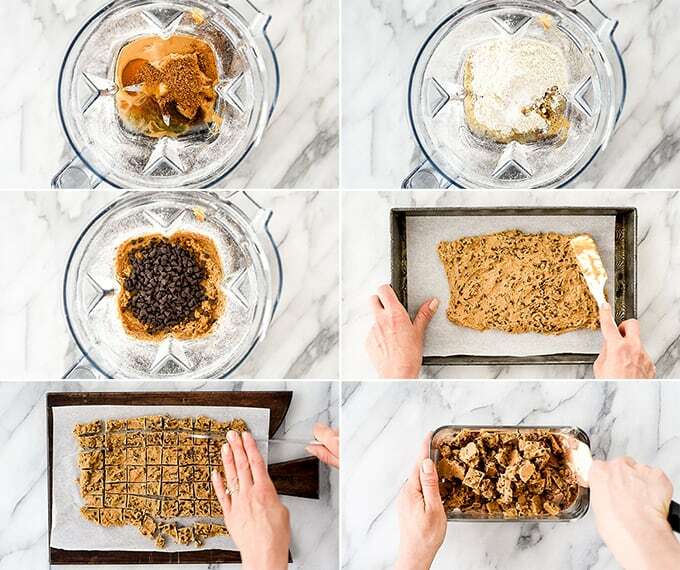 Transfer it to a cutting board and cut the cookie dough into small pieces. Add the cookie dough to the ice cream in the container and stir until the pieces are evenly distributed. Put the container in the freezer to harden for at least 2 hours. Remove ice cream from the freezer and let it sit at room temperature for 5 minutes before serving (this will make it easier to scoop)! Here are some more delicious Dairy-Free Ice Cream Recipes! I can’t even get over how phenomenal this looks. It’s what summer dreams are made of! Seriously every time I see an image of yours I find myself drooling! This is no exception, what a perfect way to cool off this summer! This is just dreamy, I love the flavor combo! This recipe looks absolutely delicious!! Chocolate and peanut butter are my all time favorite flavor combination! I’ve never thought of using peanut butter cookie dough in ice cream before, what a fabulous idea. My daughter and I love making homemade ice cream together so I think this recipe will be next on our list to try out. Thank you for sharing! !